COMEDY. A woman betrays the most important man in her life, her hairdresser, to pursue a forbidden desire…blonde hair! Outstanding Play, Third Annual Chester Horn Short Play Festival, 2007. Winner, Favorite Script, 21st Annual Wisconsin Playwrights Original One-Act Festival. 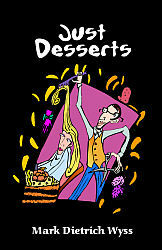 Included in the short play collection "Just Desserts." Mark Dietrich Wyss is a director and author of several short plays. His plays have won awards at play festivals and have been produced at theatres in the US. Mr. Wyss resides in Milwaukee, WI.